Online slots are taking over the casino world online. There are so many games available and talented game and software developers are creating more all the time. Coin Size: The size of the bet. Hit: Hit refers to hitting a winning combination as in winning in a slot. Hit rate: Hit rate is the average rate that the slot pays out winnings. Max(imum) Bet: The highest amount the player is able to bet with on one spin. Multiline: Multiline means a game with more than one pay line where winning combinations can be formed. Online Slots: Online slots refer to slots played with a computer or other device via Internet. Pay Line: Pay line is normally the line in the middle of the reels but there are also multiline slots available. Only the winning combinations formed on the active pay lines give players their prizes. Payout: Payout is the amount of money paid to a customer for a certain winning combination. Progressive Jackpot: Progressive jackpot is the highest winning price the game can offer. 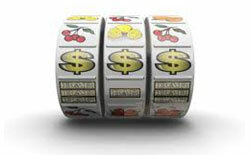 Progressive jackpots grow as players play the linked game or games. Progressive Slots: Progressive slots are slots that allow players to reach for the great jackpot that is growing every minute. Random Number Generator: RNG is here to ensure the fairness of the games. A reliable certified RNG will make sure all numbers and results are random and can’t be planned ahead. Reels: Reels or the wheels are in the slot machine spinning around and finally stopping. The symbol they are showing on the pay line determines whether the player wins or not. There are different amount of reels in different slots. Scatter Symbol: Scatter symbol is a symbol that grants more winnings or trigger features such as bonus games or free spins. Symbol: Symbols or icons on the reels are images that give players winning when they stop on the right places of the reels. Wild Symbol: Wild symbol substitutes any other symbol forming winning combinations. Winning Combination: Winning combinations are combinations symbols that are shown before with prices they grant. When the player manages to form these symbol lines, he/she is granted with the shown price amount.